Spondylolisthesis is a very common cause of back pain in the United States, affecting approximately 3 million Americans every single year. The spinal condition is chronic, meaning it can last for years or be lifelong, but is typically treatable by a neurosurgeon. Spondylolisthesis occurs when one of the lumbar vertebrae in the spine moves forward relative to the vertebrae below it, causing pain or weakness. The most common area for spondylolisthesis to occur is within the bottom level of the lumbar spine between L5-S1. This slippage can lead to pressure on the spinal cord or nerve roots which can cause back pain as well as numbness and weakness in both legs. However, not all symptoms are immediately prominent. Occasionally, a patient can slip their vertebrae and not feel any pain or numbness until years after the fact. When it does occur, however, it often manifests itself as pain in the lower back or buttocks. Additionally, the muscles in legs may feel tight or weak which can cause patients to walk with a limp. Type I Spondylolisthesis is also commonly known as congenital spondylolisthesis. Congenital is defined as a disease or or physical abnormality that is present from birth. Type I spondylolisthesis is often caused by a birth defect in the articular processes of the spine (the parts of the spine that are meant to control movement, like facet joints). Facet joints act much like hinges and run in pairs down the length of the spine, one on each side. They are largely responsible for stability and movement within the spine; they keep the bones in the spine lined up, while still allowing them to move and remain flexible. However, in type I spondylolisthesis, the facet joints don’t work properly and allow a vertebra to slip. This most commonly occurs where the lumbar spine and the sacrum join, near the L5-S1 area. Type II spondylolisthesis, also known as isthmic, is the most common form of the condition and it usually occurs in adults as a result of abnormal wear on the vertebrae from repetitive stress. In Isthmic II spondylolisthesis there’s a problem with the pars interarticularis, a section of bone that sits towards the back of the vertebrae. 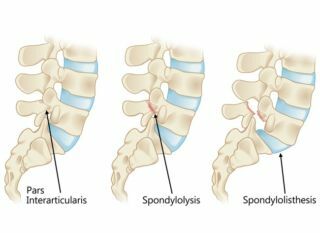 Type II spondylolisthesis can be divided into three individual subcategories. Type II A: This form of Type II spondylolisthesis commonly occurs in people who engage in high intensity, contact sports like football, gymnastics and weightlifting and have multiple microfractures in the pars interarticularis due to overstretching (hyperextension) and overuse. In this condition, the pars fractures completely which allows the injured vertebrae to shift or slip forward. Type II B: This form of spondylolisthesis is similar to Type II A, however in this condition the pars interarticularis fractures, but does not fully break. Instead, new bone grows in an attempt to heal the damage which causes it to stretch. A longer pars can cause the vertebrae to slip forward. Type II C: Like type II A, this condition does involve a full fracture of the pars interarticularis. However, instead of long-term overuse and hyperextension, the break is caused through intense trauma (like a car accident). Aging and disc degeneration are the main culprits in type III spondylolisthesis. 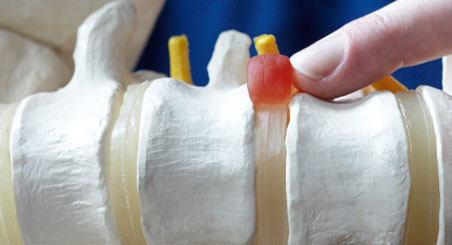 Over time, vertebrae discs naturally begin to lose water as their outer wall, known as the annulus, weakens. As the discs lose water, they shrink which brings the vertebrae above and below, along with their facet joints, closer together. With this extra space and without the discs acting as a cushion, the facet joints cannot control the movement of the vertebrae as well and they become hypermobile which can, eventually, lead the a vertebrae disc moving forward. This type of spondylolisthesis commonly occurs in the L4-L5 region of the spine. This type of spondylolisthesis shares some similarity to Type II C in that it involves a fracture. However, in this condition, another item in the vertebrae breaks instead of the pars interarticularis which causes a slipped disc. This form of spondylolisthesis is caused by spinal tumors that weaken the bones in the vertebrae and cause fractures. These fractures can lead to instability and cause a disc to slip. Type VI spondylolisthesis is the result of a surgery that causes a vertebra to slip forward. While uncommon, type VI, also known as iatrogenic spondylolisthesis, is caused by a weakening of the pars interarticularis often as the result of a laminectomy, a common spine surgery. It’s important to note that spondylolisthesis should not be confused with spondylolysis. While the conditions are often related, spondylolysis describes the condition caused by a crack or small fracture on the pars interarticularis while spondylolisthesis is the result of a slipped disc, often due to a full break in the pars interarticularis. The pars interarticularis is the weakest portion of the spine and is highly susceptible to fracture due to repeated stress or traumatic injury. Many people who have spondylolisthesis are symptom free and only know they have the condition after an x-ray. However, for patients who do have symptomatic spondylolisthesis, the pain can range from mild to severe. Spondylolisthesis can be difficult to self-diagnose mainly because it does not commonly contain any symptoms. This being the case, x-rays are the best way to diagnose the condition. X-rays will comprehensively show if any of the vertebrae are out of place, fractured or slipping. During the x-ray the patient will likely stand facing the side so that the physician can get a lateral view of the spine that will clearly show if any slipping has occurred. Additionally, physicians can perform a physical examination of a patient if they suspect a disc has slipped. In this exam, the spine specialist will observe the patient’s posture and range of motion. They will also likely touch the spine to check for tenderness, muscle spasms and alignment issues. 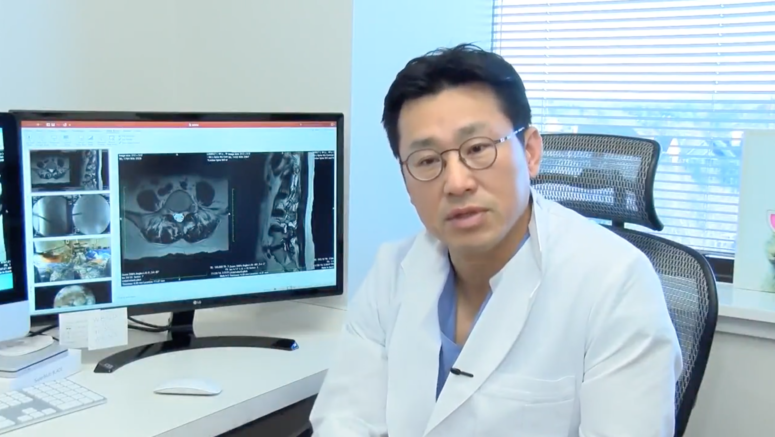 In many cases, people who have been diagnosed with spondylolisthesis don’t need surgery. Typically rest, anti-inflammatory drugs like ibuprofen, bracing and occasionally physical therapy is enough to promote healing. However, surgery may be necessary for patients who have a high degree of disc slippage, slippage that is progressively worsening or is damaging the nerves within the spine. 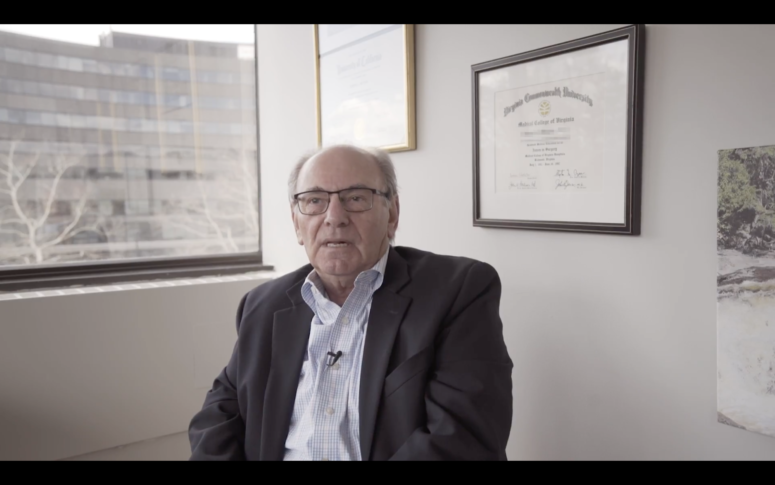 There are a number of surgical options for patients depending on their type of spondylolisthesis. The most common form of surgery for this condition is fusion which fuses together the two affected vertebrae to eliminate motion and further slippage. Additionally, if fractured pieces of the pars interarticularis or the slipped disc are putting pressure on the spinal cord, decompression surgery will be required to remove the bone material.